Yum! This sounds delicious! I love sesame oil (and a tiny bottle does last forever!) – good to know about the smoke-point, but I must have been using it right because I’ve never ended up with the bitter flavor. Pinning this! Thanks! You know what I hate about the bottle as well? Since it is small they make the top have that like dripper cap so it doesn’t pour out, but since you have to thus shake it gorvthe oil, the outside of the bottle is always slimy with oil, haha! O no! Well just replace it with some almond or cashew butter! I love sesame seeds! I’ve made healthy sesame chicken and it was great! I have had tahini when I made falafels….it’s so yummy. I have been meaning to buy it and I have heard great things about black tahini as well! 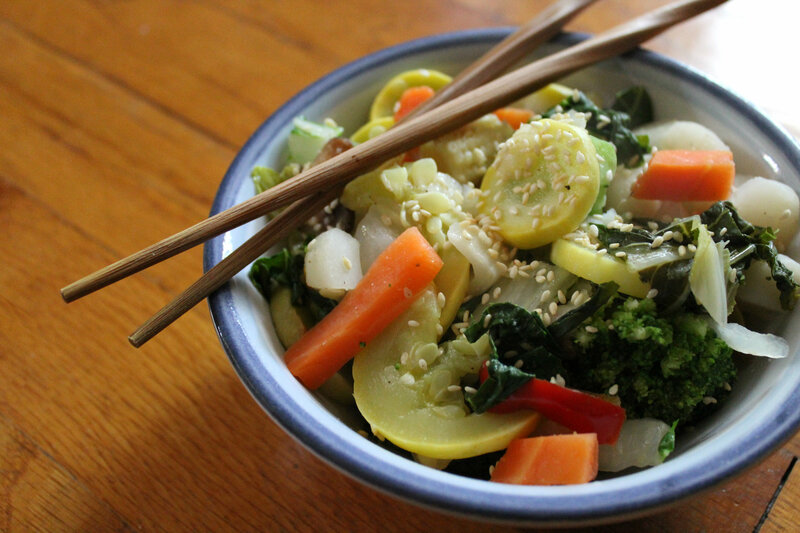 I am a big fan of big bowls of steamed veggies like this! In fact I had one for dinner. 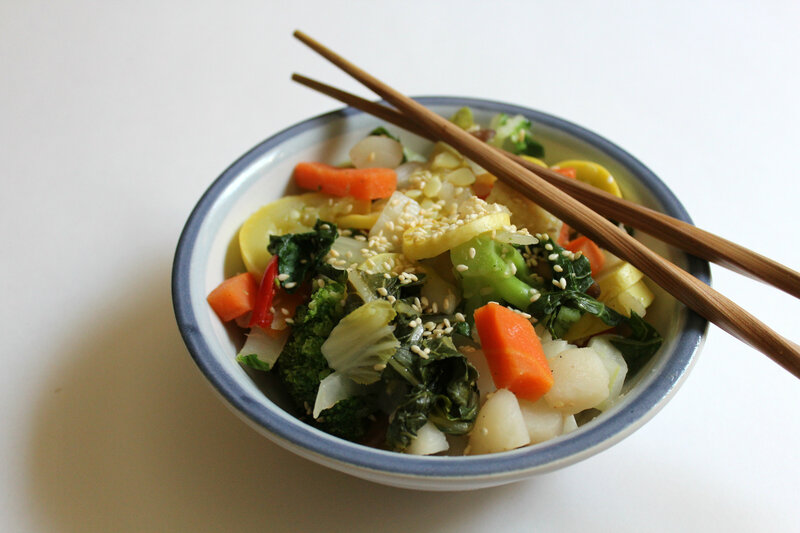 Iespecially love the use of sesame oil, rice vinegar and ginger in this recipe! I usually put my veggies on a bed of brown rice or quinoa. 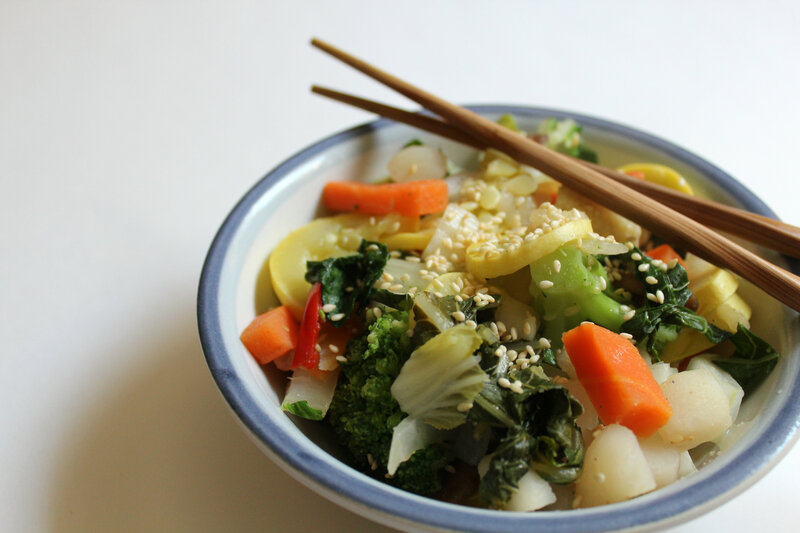 Sometimes I use soba noodles.Thanks for sharing this healthy, delicious recipe! Oops I meant to tell you that I am so glad I found your recipe on Diana Rambles linky party! I have used this to top grain bowls and with beans as well! Its a great addition piece. I use a lot of sesame oil but I’ve only cooked with sesame seeds a few times. This dish sounds amazing and I love all the veggies. I’m putting it on my list! Sesame rocks! Let me know if you give it a try! You won’t be disappointed. You can never go wrong with a total veggie dish!